Physics major wins URISC Award ! 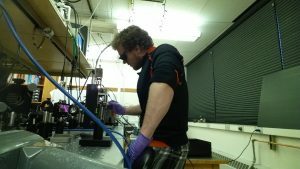 Congratulations to a physics major Graham Founds who received an Undergraduate Research, Innovation, Scholarship and Creativity (URISC) Award for Summer 2016 for his project titled “Optical Tweezers-Based Probing of Charge Transfer in Organic Semiconductors at Microscopic Scales” ! The URISC program is a university-wide competition of undergraduate proposals sponsored by the OSU Research Office. Graham’s proposal was among 8 compelling undergraduate proposals that were selected for funding. Graham (pictured below) has been a member of Organic Photonics and Optoelectronics Group led by Prof. Oksana Ostroverkhova at OSU Physics department since September 2015. With the URISC funding, he will continue working with Prof. Ostroverkhova over the summer towards demonstrating a new experimental technique for measuring charge transfer between molecules with elementary charge resolution. Graham is planning to graduate in the Spring of 2017 and to continue his education as a graduate student in physics. His longer-term plan is to join the US Air Force laboratories as a research scientist. Physics undergraduate student Graham Founds setting up his experiment. Posted in Awards, Research, undergrad_research, Undergraduates.